The New England Soccer Classic invites officials to apply online to participate in this years event. We understand that the quality of the work you do is an integral part to a quality tournament experience. All officials will be required to show proof of grade prior to or at the Officials Check-in Meeting Friday night. Lodging - 3 nights (Fri.,Sat., & Sun.) to those that are available to work a minimum number of matches Saturday, Sunday, and Monday. Meals - Lunch and Snack provided each day. Assessment Opportunity - We will be hosting assessors to allow for evaluation and grade advance. 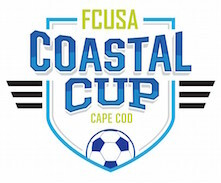 The FC USA Coastal Cup invites officials to apply online to participate in this years event. We understand that the quality of the work you do is an integral part to a quality tournament experience. We provide meals. lodging and competitive game fees for the officials.